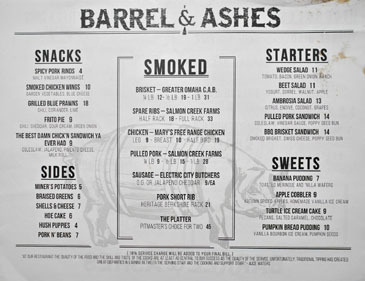 The BBQ scene in Los Angeles has certainly been heating up as of late, and adding fuel to that fire is Barrel & Ashes, which debuted on November 7th after a secretive preview the week earlier (and a pop-up at Short Order). 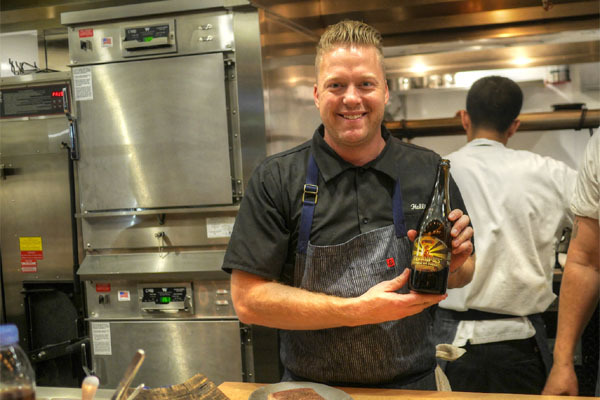 The Texas-influenced joint is another Bill Chait production, and this time he's partnered up with Timothy Hollingsworth (The French Laundry), Rory Herrmann (Bouchon), and Jeff Sladicka, one of the co-owners of the Spark Woodfire Grill location where B&A's housed (he and Chait opened up the place with Danilo Terribili in 1999). Meanwhile, running things at a day-to-day level is Chef de Cuisine Michael Kahikina, a CIA grad and former sous at Bouchon. The old Spark space has been revamped to convey a more rustic, more casual sort of aesthetic. There's lots of communal seating of course, and also a small bar and kitchen counter, not to mention picnic tables out front and supposedly something going on in the back, too. I'm curious to find out what they did with the upstairs, which functioned as a private dining room back in the day. 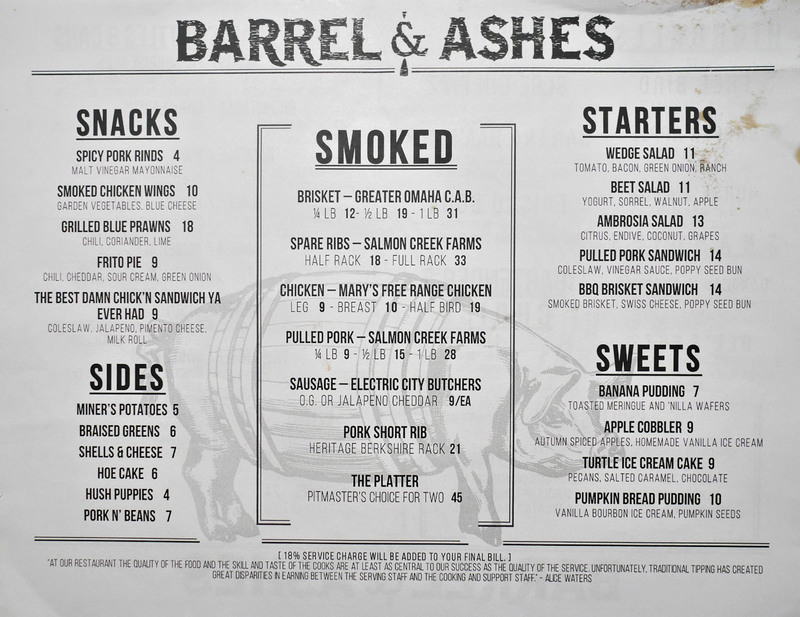 The Barrel & Ashes menu features the standard selection of meats and sides, but gets a little schmancier with its apps and desserts. Drinks, meanwhile, are the charge of Julian Cox. 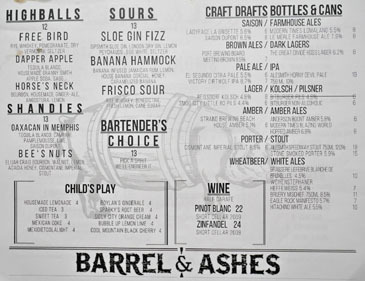 He's done a nice job here with his fun, barbeque-friendly cocktails, which are joined by craft beers, a couple of wines, and a pretty wide array of whiskey. Corkage is $20, but was waived this evening after we politely asked. Click for larger versions. Naturally, given who's behind the program here, we gave the cocktails a whirl. 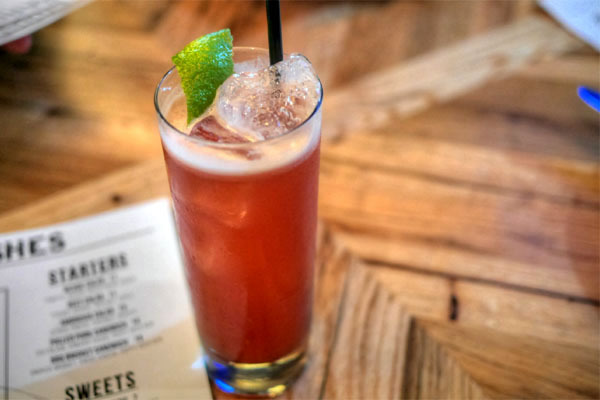 Our first did a commendable job integrating the pomegranate with the bittersweet, almost medicinal notes in the drink, and the contrast between the booziness of the rye and the effervescent seltzer worked well enough. For me, this was the most intriguing concoction of the night: citrusy and bright initially, with the weight of the bourbon coming in later, then finally finishing long with the roasty qualities of the stout. A very neat evolution of flavors. 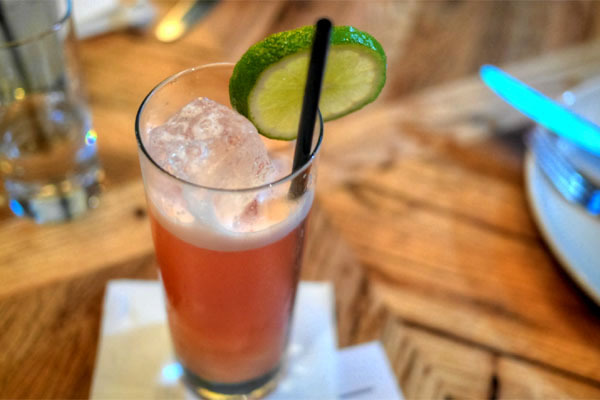 The last cocktail of this round was also a favorite of mine. I loved the bright, fragrant aroma of pomelo here, and the juiciness of the fruit melded beautifully with the smoky spice of its accompanying elements, too. Nice! 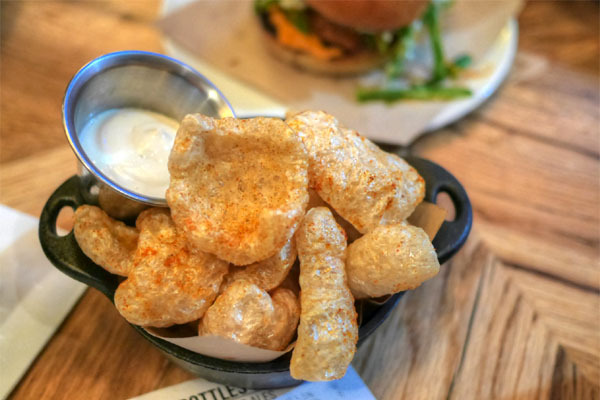 We had to start with the pork rinds, and they were indeed some of the best I've had, all porky and crispy and airy, tasty alone, but even better with a dab of the tangy mayo. As far as chicken sandwiches go, I've not found anything so far that can unseat Son of a Gun's. That being said, the one here still made a strong showing for itself. 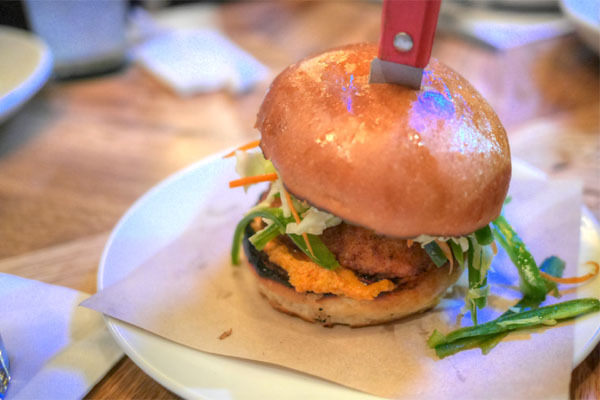 The key was the interplay between the slaw and the lushness and heat of the pimento cheese. Even the bread was well-textured and very appropriate, making everything come together deliciously. You might want to order this. 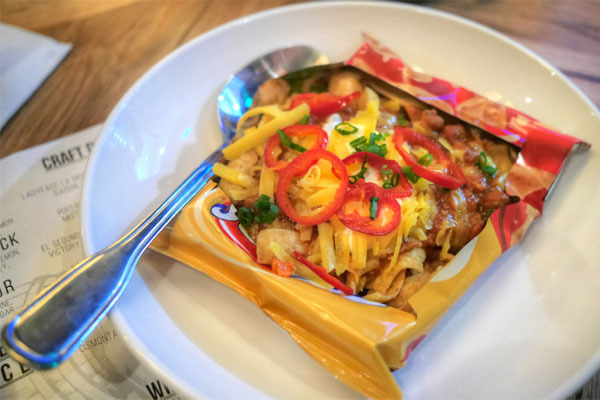 We couldn't resist the down south snack of Frito Pie, natch. I'd had a gussied up version at Bar Ama before, but this was actually my first time trying a more traditional preparation. It was just what I wanted though, a mish-mash of straightforwardly satisfying flavors over a base of crunchy corn chips. Just the right amount of slutty. 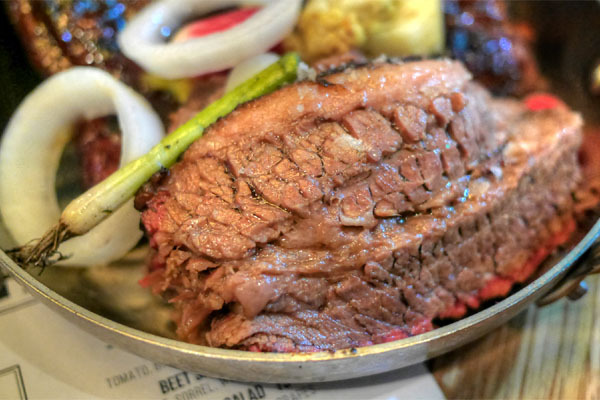 Given that B&A's supposedly a Texas-influenced joint, we had to start with the brisket. It was some of the juiciest I've had, all tender and flaky and with a nice ratio of lean to fat. Very tasty, though I wanted a touch more smokiness if I had to nitpick. If you only get one meat, make it this. Spare ribs were also laudable, coming out sticky-sweet and just tender enough, with a gratifying meatiness to it all. 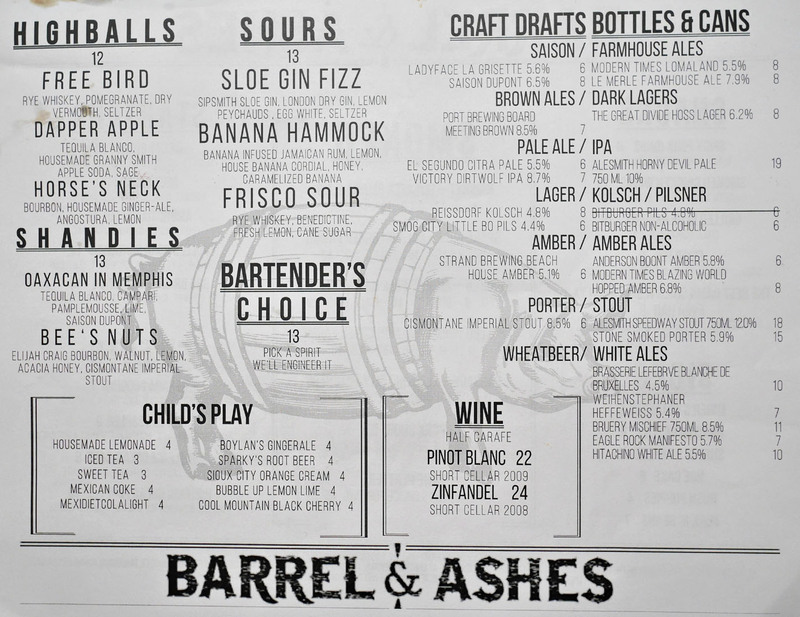 Barrel & Ashes' rendition of mac & cheese was one of the best I've tasted. Great texture on the pasta, and I loved the sheer creaminess and cheesiness of it all. 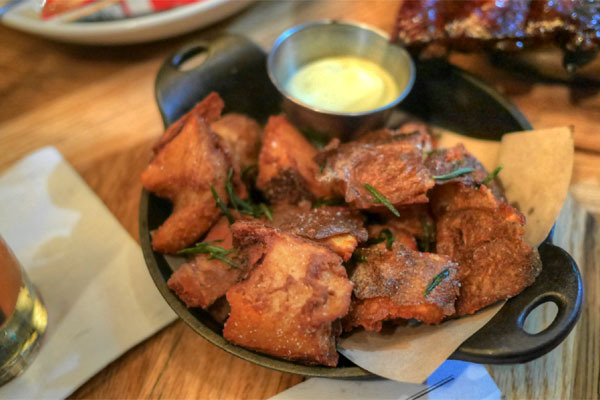 The potatoes were also a keen pairing, arriving crisp and hearty, accented by the aromatics of sage while the accompanying sauce served as a creamy counterbalance. Can't go wrong with this. 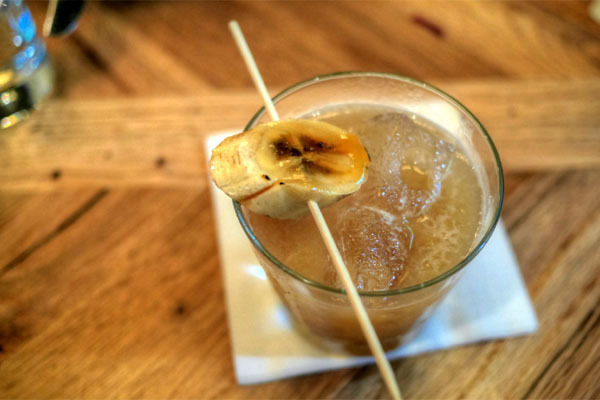 Round #2 for cocktails brought out this whimsically-titled number, a real celebration of banana-y sweetness, offset by the potency of the rum and just the right amount of lemon-y zest on the close. 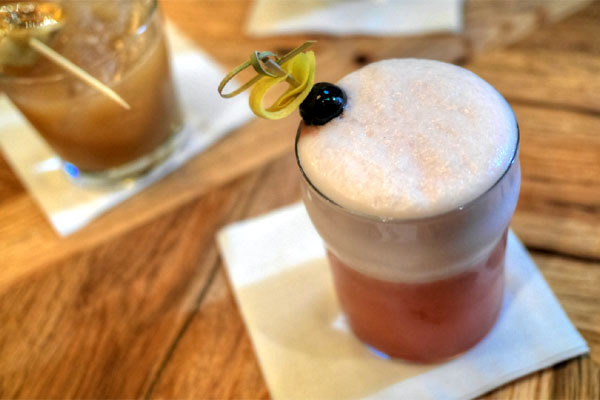 B&A's take on this classic fizz was to my liking, with its great mix of sweet and tart flavors played against the frothy egg white, the dry gin adding a wonderful hit of botanicals toward the back end. 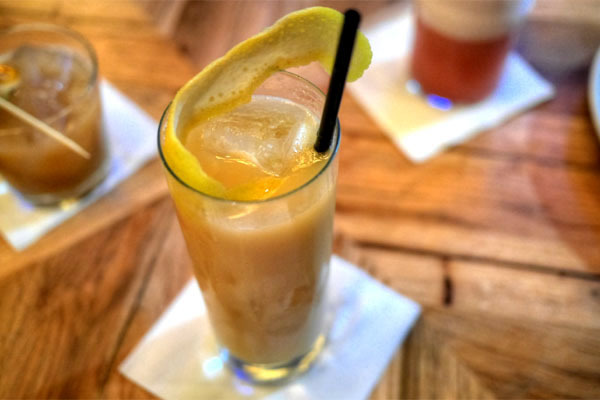 Our last cocktail was also a take on something old school, and just happens to be the restaurant's most popular drink. It was almost bracing in essence, with a sharp, in-your-face blast of contrasting ginger and lemon notes over a backdrop of bourbon. 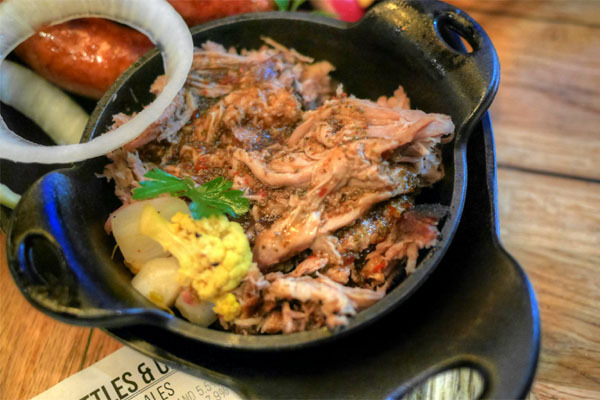 The pulled pork was about as tender as you can get, with a mix of porcine and tangy flavors intermingled with a hint of smoke. Particularly good with the accompanying pickles, though I wanted more of those crispier bits thrown in here for some textural variation. 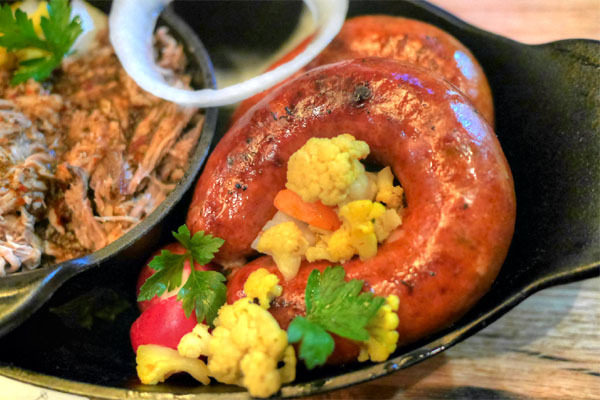 Sausages are sourced from Santa Ana's Electric City Butchers, and were on point. The O.G. 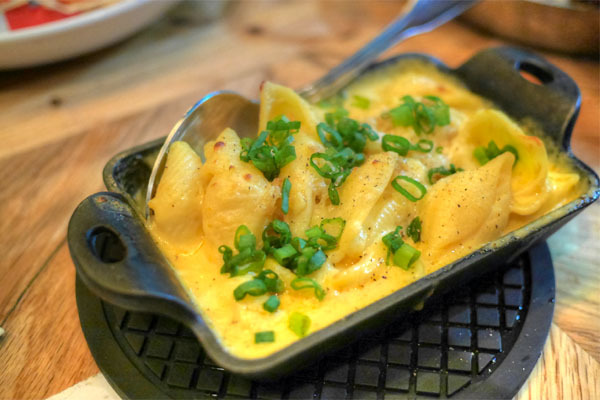 had your classics flavors in a delightfully snappy casing, while the Jalapeno Cheddar was even better, their version of Käsekrainer featuring lush, creamy cheese and a great bit of creeping heat. Yum. Pork 'n' beans looked impressive, and indeed the actual pork was. However, the beans veered overly soft, overly sweet for me. I would've liked them firmer, with more of a peppery/spicy bent. 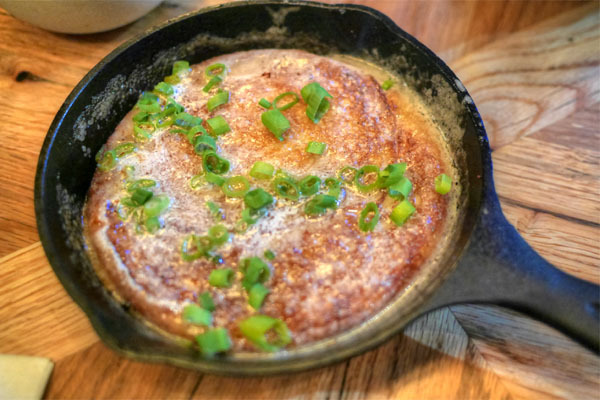 Now, the hoecake has sort of become an early favorite when it comes to sides here, and that's for good reason. 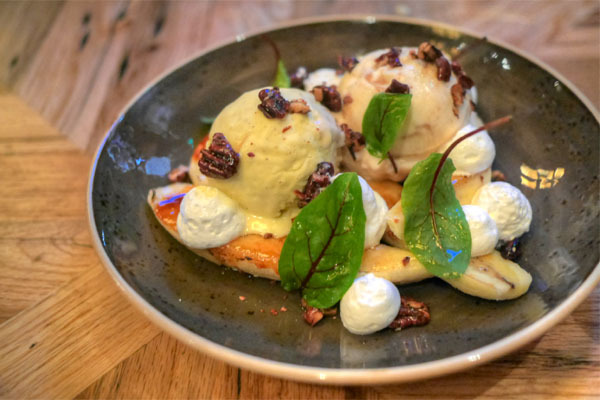 It's sort of like the best pancake you've ever had, a sweet, fluffy, beautifully caramelized disk with a savory edge. A must try. 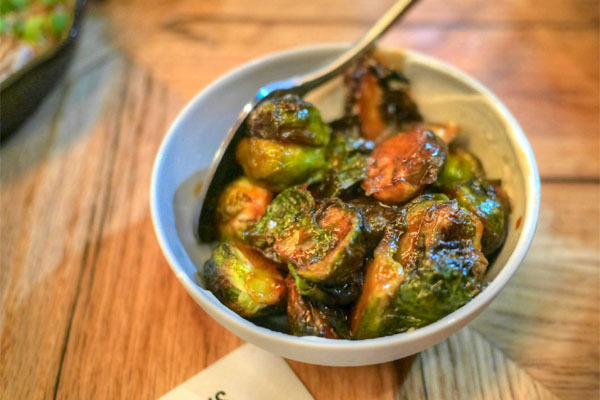 Regular readers will know that I'm a huge fan of Brussels, but these similarly went too sweet; I wanted the bitterness of the veggie to shine more. 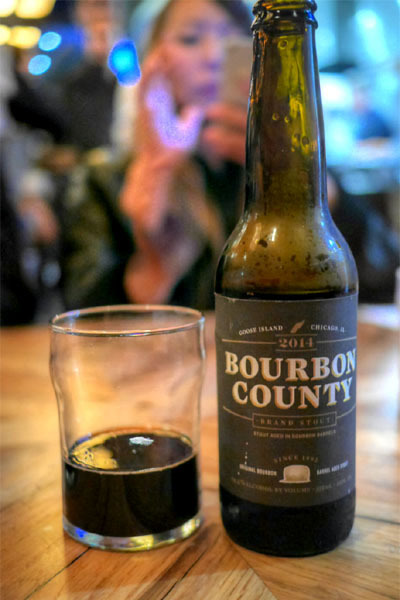 For dessert, I brought out two bottles of 2014 Goose Island Bourbon County Brand Stout that were just purchased the previous day (during the Black Friday release), one from the 13.8% ABV batch and one from the 14.4% ABV batch (from different blends of bourbon barrels I take it). We began with the lower strength bottling, and found it all sorts of wonderful, with a nose redolent of delicious dark fruit, toffee, molasses, vanilla, and subtle smoke. In terms of taste, there was more of that, plus a distinct chocolate character and a good amount of malt and bourbon, with surprisingly little alcoholic heat. 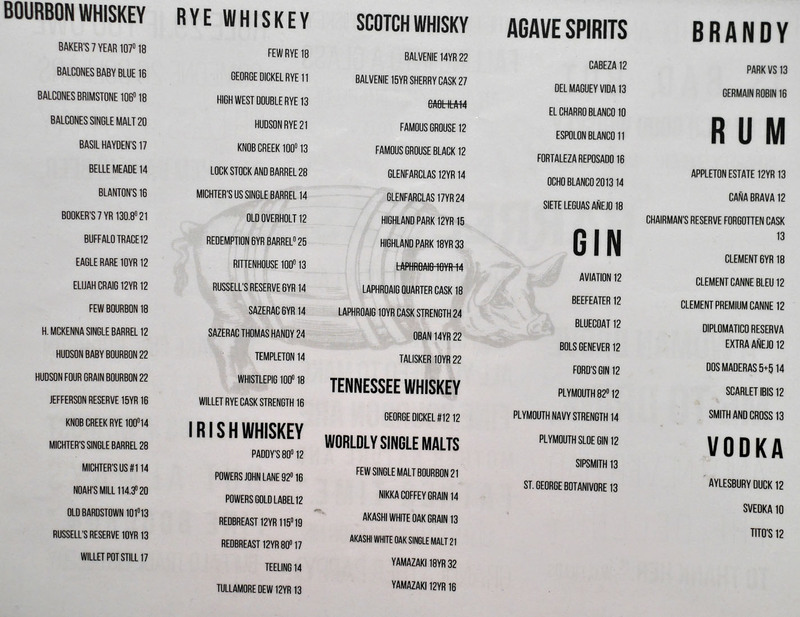 The 14.4% version, when drank side-by-side, wasn't quite as good (though it was still very good). I got a noticeably weaker nose, with a bit more oakiness, while on the palate, I tasted less chocolate and more roasty malt. Time for dessert. As you probably know, I'm not a fan of peanut butter, so I wasn't particularly looking forward to this ice cream. 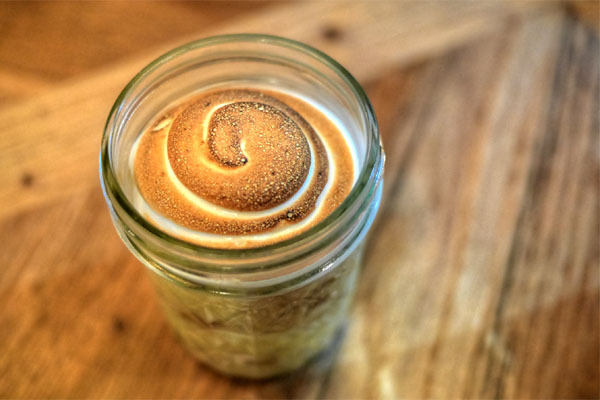 Given that, this wasn't too bad, as the actual peanut butter was fairly restrained, offset by the sweetness of banana. Banana was also used very successfully here, the creamy, rich, sweet pudding satisfying in a simple sort of way. 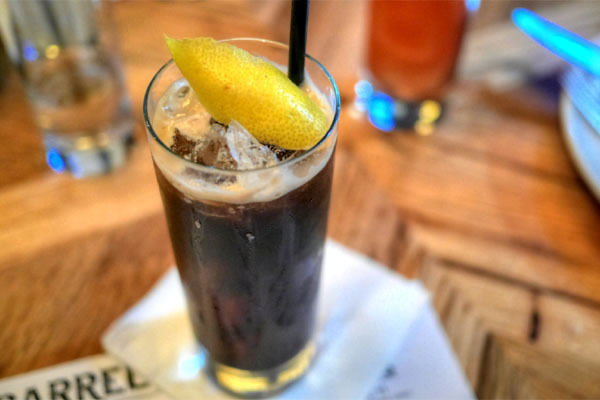 The Arnold Palmer sorbet stayed true to its namesake, delivering an invigorating mix of sweet-n-sour. 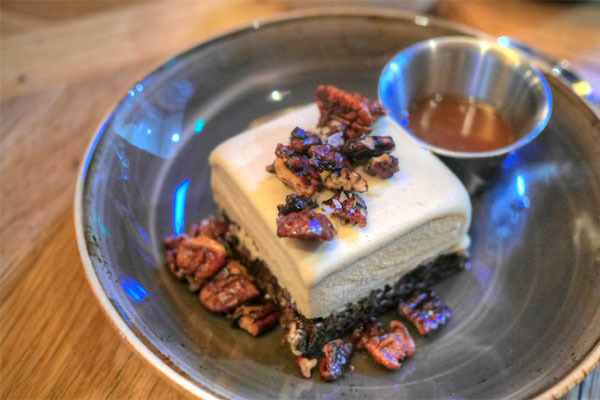 My favorite dessert was clearly the turtle candy-inspired ice cream cake. 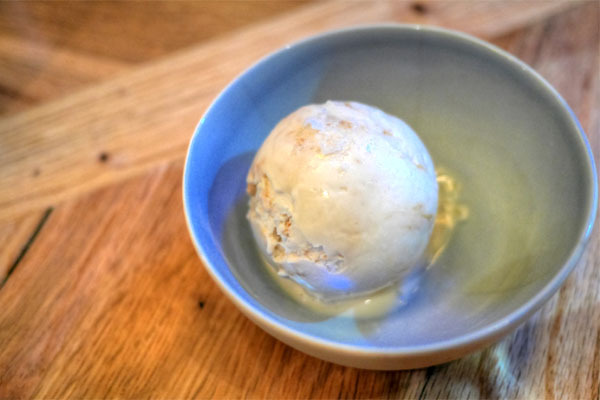 The balance of nutty, caramel, and salty flavors was spot on, and worked perfectly with the ice cream. Fantastic crunch here too from the pecans and "crust" of the cake. Damn. 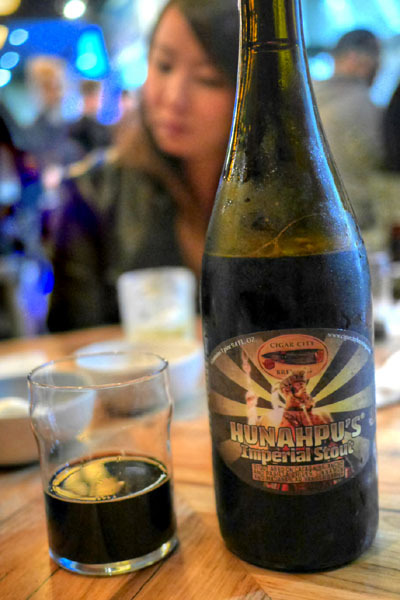 My last bottle was the much-hyped 2014 Cigar City Hunahpu's Imperial Stout, which I'd been wanting to try for a while now. A stout brewed with cacao nibs, ancho and pasilla chiles, cinnamon, and Madagascar vanilla beans, the beer's made once a year and released only at the brewery in Tampa (though not anymore, apparently). It was one of the most multifaceted beers I've had, and managed to live up to high expectations. I found it spicy-sweet, fruity, and chocolate-y, yet somehow restrained on the nose--complex, and obviously special. The liquid made even more of an impact on the palate with gobs of dark fruit at first leading to spicy, sweet, floral vanilla, and bitter cacao nuances and a finish tinged with a tingling amount of chile heat. Lots going on, but very well put together; I could totally see a dessert based on these flavor profiles. As you can see above, we made sure to share some with the kitchen, too. Around this time, we ran into Ivan Marquez of Short Cake, whom we met at the last Plate by Plate tasting. 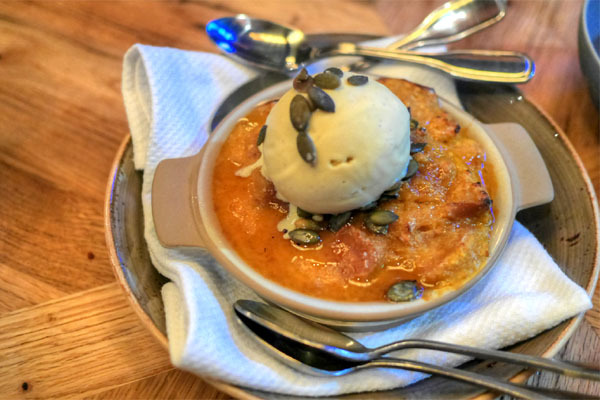 He was working part-time at B&A and sent out a bread pudding, perfect for the season. 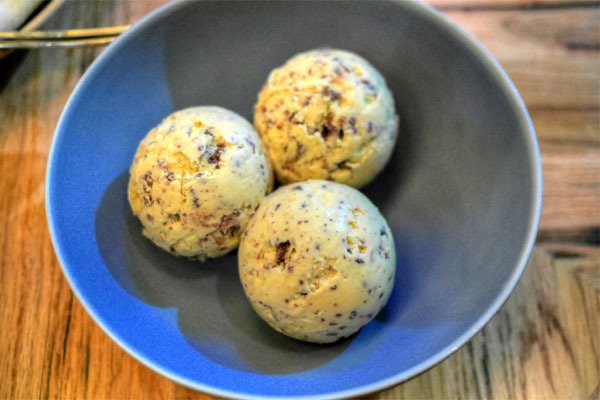 Great autumnal flavors here to go along with that fantastically boozy ice cream (I could use a pint of the stuff by itself). 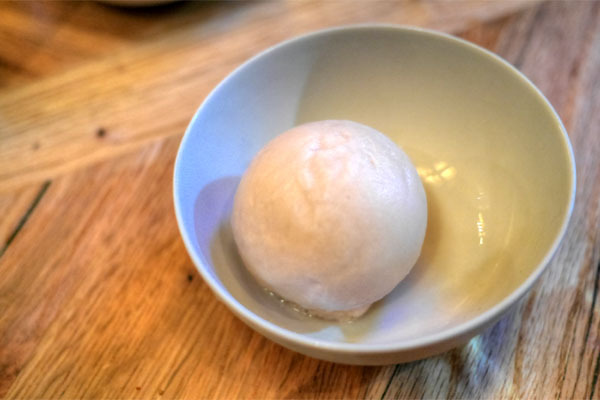 Along with the bread pudding came three of the most perfectly spherical scoops of ice cream ever. Delectable, and the most cookie-forward cookies 'n cream I've had. In addition to the beers, I also had in my cooler a fully-cooked, sous vide'd Miyazaki striploin left over from Thanksgiving. We handed it over to Marquez, who in turn gave it to Hollingsworth to finish on the wood-fired grill. The results were pretty marvelous, actually, despite the meat not being "fresh." There was some great char and smoke imbued into the beef, and the way the marbling was presented just worked. 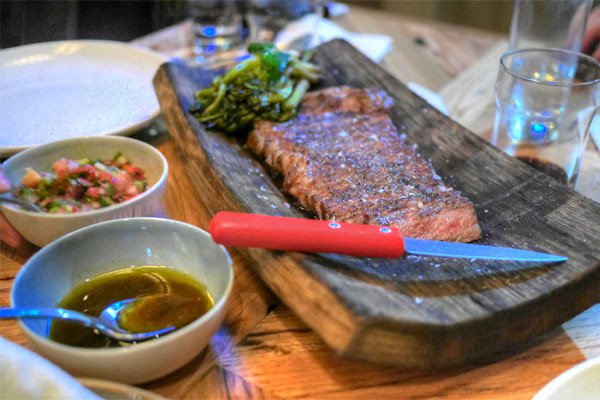 The steak stood alone, but the grilled scallion, balsamic dressing, and pico de gallo-esque salsa especially made it even better. We were all impressed at how well the kitchen pulled this off on the fly. Last up was Marquez's off-menu banana split, just about the most refined version of the childhood favorite that you'll ever find. 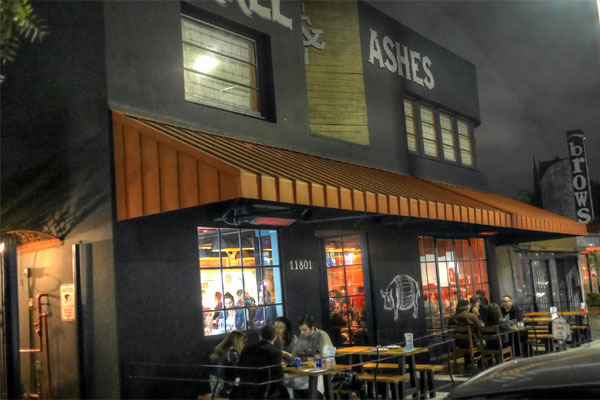 We have another worthwhile addition to LA's barbecue lexicon here with B&A. Its cheffier approach is a welcomed change of pace from the homier presentations of the style you usually find, and I especially appreciate what was done with the apps, desserts, and drinks here. Taken all together, you have what I'll call a complete dining experience, which is often not the case when it comes to 'cue. 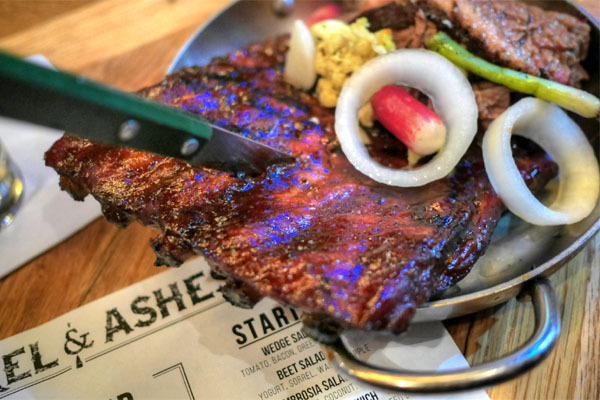 BBQ fiends should definitely check this place out. 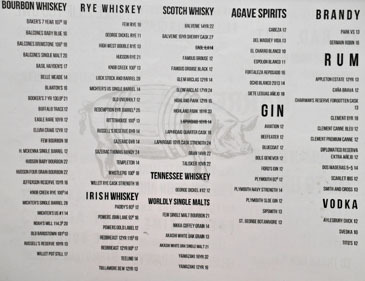 This is Prohibition Pig (prohibitionpig.com) west to me. Come visit Vermont some day, you'll be surprised. How do you get so many of these insanely rare beers Kevin? 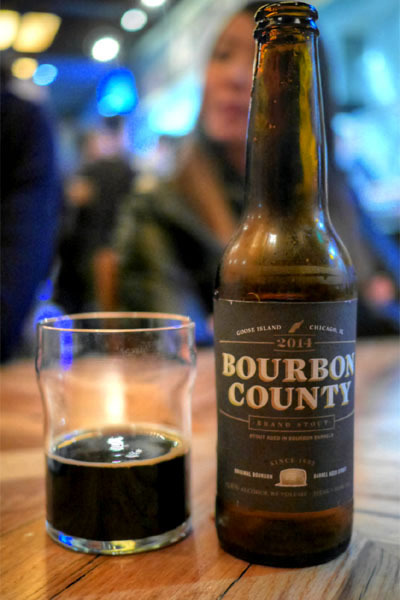 Bourbon County is almost impossible to get. What a waste of great culinary talent. I do hope they collaborate and do a great restaurant. I'm sure it's very jive BBQ but it doesn't take those chefs to do good BBQ. David, I beg to differ with you. There are plenty of BBQ joints around and few manage to make food that's not either dry, tough or drenched in sauce to mask the meat. 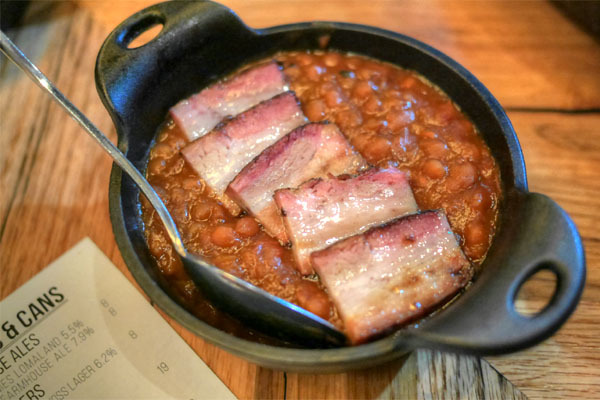 Good BBQ is rare, indeed, and a pitmaster who spends 18 hours smoking a brisket to perfection beats a chef who spends ten minutes sauteeing a filet of sole and throwing together a pan sauce any day.